To read our walk reports, please click on the button above (or click here). Photographs to accompany the reports can be found in our gallery. Biggar Ramblers A.G.M. in the Elphinstone Hotel 14th November 2016, 7:00p.m. Pam Hart, Jlhn Hart, Lynn Weir, Jo Cox, Lesley Glidden, Kathy Henry, Brian Henry, Isobel MacDonald, Michael Heale, Fay Young, Carolyne Murray, Sheila Forsyth, Nancy Porteous, Jan Airlie, Marion MacMillan, Blane Duncan, Andy McGregoe. The meeting began shortly afer 7:00 pm with a welcome from Brian who thanked those who had come. 3. The minutes of November 2014. Theses were available for reading at the start of the meeting. They were accepted by L Weir and seconded by F Young. 1) The committee had met three times with each of these linked to the next programm. Much work goes on behind the scenes so meetings run smoothly with an update on Finance, news from HQ, social plans, and newletter items. Discussed this year has been the introduction of a walk attendance list; a mobile phone list of leaders; alternative venues for the Christmas meal; the new website; reports on Crianlarich and walking Glencoe to Lochmaben. Earlier in the year we heard of the sad news of the loss of Robert Ross, a long standing member of Ramblers and a past committee member, Brian paid tribute to his memory. Recently there was the disappearance in Glen Nevis of Tom Brown (Lanark) A memorial service had been held in Lanark. 2) His personal sucess story of the year was completion of the last of the Donalds, which he had not known of as a list of specific mountains until joining Biggar Ramblers. He thanked those who had accompanied him on this personal objective. 3) Rosemary Turpie has resigned as co-ordinator of the walk and talk events due to ther commitments. She was congratulated on the book of walks she produced earlier in the year based on these walks. She will act as leader at times. 1) membership numbers are 67 as at end of September. The few changes in numbers are attributed to resignations due to death or ill health but there continues to be new interest. Many people continue to pay their subscriptions even if they no longer walk regularly. 2) There has been a slight increase in membership costs. Payment anually by Direct Debit, cheque or postal order is £34.00 for individuals and £45.00 joint. Payment monthly adds £3.00 or £4.00 more. 3) Scottish Council will meet in Dunfermline 11th - 12th March 2016. Area Council AGM will meet in the Elphinstone in Biggar Saturday 16th January 2016 at 10:00 am. There will be short walk in the afternoon weather permitting. b) Festival of Winter walks 19th Dec.-3rd January. Our walks will appear on the 'group walks and events manager' section of the Ramblers website. 1) The accounts were available for reading at the start of the meeting and are attached to this report. The General account shows a balance of £868.07 with little activity over the year. The main expenditure is the production and postage of the programme and newsletter. There were no website costs with the domain name paid bi-aually. This might increase with the development of the new website. We claim only the basic costs from Ramblers Associations. Once the recce balance in the activity account was exhausted money was paid from this No.1 account with only 50% paid from the No.2 account. 2) The social account has most activity and has a balance of £1549.31---a deficit of £296.26 over expenditure.The suspension of 50p walk donations will continue since recce funds can be claimed from area funds if required. The away weekend broke even. SLC had tightened up the criteria for the Xmas meal grant and this was only available to those over 60 who are resident in South Lanarkshire. This year it is no longer available. Stan Brown was agreed as Auditor again. Proposed by Blane Duncan and seconded by Michael Heale. He thanked all walk leaders for the number of walks provided and the variety of grades and places visited. The programme is now on the new website. The programme is now on the website. However copies will go out with the newsletter in the next mailing. This year saw the introduction of walk attendance list with emergency contact details. Walk leaders to hand these to Lesley who will collate the numbers on each walk. There will be an updated version of this issued with the new programme. This year also saw the introduction of a mobile phone list showing details for each leader per programme-- a method of contacting in case of problems in meeting up. Any documents required by leaders go out with each new programme. Ideas for the next programme will be sought at the Christmas meal or any time prior to that. The next committee meeting will discuss the need to pay closer attention to the gradings as they appear on the programme. This was due to two walks that were possibly wrongly graded. 1) Spring weekend to Crianlarich in the hotel there, 23 attended at the cost of £148.00 each sharing a twin room and £178.50 for a single. The rooms varied in size but the group was satisfied with the hotel, the friendly staff and the food. The location offered easy access to walks to suit all tastes with the train station and West Highland Way on the doorstep. The weather was reasonably kind with snow and rain only intermittent. The high level walk was a challenge due to the deep snow especially near the top. The plans are well underway for the 22nd - 24th Aril weekend in the Deeside Inn in Ballater. The deposit has been paid. Walk leader suggestions are sought. Walk reports had been pulished by the newspapers, and forwarded to Lesley for insertion on the website. 1) Has attended 2 meetings of the Clydesdale to Solway Area Council at Abington and the area AGM in Hamilton. One discussion was how to appeal to younger people-possible 'designer gear' type clothing, hill walking/risk assessment courses at Glenmore Lodge. Reports were given from those who attendedn Scottish Council in Dundee and General Council in Cambridge. No further progress on setting up an area website and the idea of a 50th anniversary event of Ramblers Scotland is no further forward. The new Scottish Director, JessDolan is keen to visit groups. he has been invited to attend one of our walks. There is money available in the roup Support Fund-some groups use this to purchase maps. The area AGM will be in Biggar in 2016. More details nearer the time. However most discussions are on cycling and horse riding access problems. 3) He continues to collate the Newsletter issued three times a year and puts up posters advertising our programme in a variety of places. Request that members send items for the newsletter. 5)This has taken time but is free of costs. It was ready Friday past although work has still to be done on the gallery. The site will be updated once a week with the gallery once a month/quater possibly via Flickr. News can be passed around and it is very user friendly. New members can download a membership form for CY02 group. Brian thanked all committee members for their work over the year. He also thanked all walk leaders. Without these people there would be no group. Donations will as usual go to Stan the auditor and also to the web site designer. Rosemary has done sterling work over the 3 years and her walks have been both short and informative. Is there a need for another co ordinator or will it be sufficient to ask for leaders for this type of walk? They need to be any day of the week, 10.00 - 12.00 approx. level terrain, 2/3 miles in length with something of interest, and the availability of coffee or lunch. 1) Question of Roy as keeper of the library and access to the material. After much discussion about what we need, where to store it and whether we do require a seperate library of materials in light of walk leaders knowledge and modern methods of sourcing details it was decided that Blane would ask Roy and offer help in drawing up an invetory of what we already have, discard any out of date items and make a list of what remains. Committee to discuss this further. 2) Sweat shirts and T-shirts with Ramblers Logo. Lesley to investiate and report back to the committee. The entire length of John's Path has been given a strim and is passable all the way from Blyth Bridge to Grantshall. This path is in real danger of being lost if it isn't used- it's really a beautiful walk along the banks of Tarth Water, so if you fancy trying a new walk, this is a really great one to do. It's about a mile and a half from Blyth Bridge to Grantshall ( on the A72 just south of Castle Craig) - park up in Blyth Bridge and walk there and back. Even better, get the bus to Peebles and get the driver to drop you off at Grantshall and walk back - 6 miles to West Linton from there. Its walk B3 on the website ( www.northtweeddalepaths.org.uk) if you want to print off the details. The more feet that bash the grass down, the better! A member of the Falls of Clyde Heritage Group was spawned from the Working group of local and national organisations which successfully opposed the extension of Hyndford Quarry into the Bonnington area at the Falls and which is now aiming to promote the heritage of the area around the falls in various ways. The first venture ia a weekend over 20/21 August call "celebrating the Falls of Clyde" to be based at New Lanark with walks and talks featuring the Falls. The Saturday will be invitation only conference and the Sunday will be a public drop in event. On Sunday we are hoping to offer a range of guided walks of interest and a range of outdoor artistic activities. One idea is that we ask local walking groups tp meet for a short introduction and then to walk the Bonnington Corehouse circuit. I wondered if this would interest your group either as a group or as individual members. The Development Trust has applied for lottery funding to ransform the derelict sawmill building at Castlebank into a classroom and community hub. They would like 1,000 signatures to help support this application. All you need to do is click on the Lanark life link below and add your name, address and email to the petition. northtweeddalepaths.org.uk is set up to help you find walks all over north tweeddale. They described as Easy- less than an hour, Moderate-up to three hours and Strenuous-for half a day if not all day. This might be useful for Biggar Ramblers looking for interesting walks. It also publishes posts giving users information about problems with certain routes.Its worth a look. Map Library: Did you know that, as part of your Ramblers membership, you can borrow maps from our map library? We have a range of Ordnance Survey Explorer 1:25000 and Landranger 1:50,000 maps. Maps are available for loan to Ramblers free of charge, you just pay for return postage. A maximun of 10 maps can be borrowed at one time. 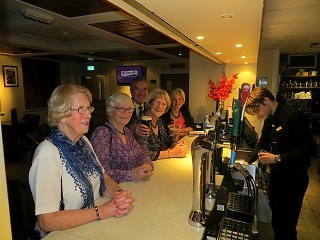 As you can see Biggar ramblers enjoyed another great Christmas evening at Carols by Candlelight at the New Lanark Hotel. In the afternon prior to the dinner we enjoyed a lovely walk by the Falls of Clyde. On October 10th 2015 Biggar Ramblers walked up Culter Fell to help our Chairman Brian Henry to complete his last Donald, he has walked up all 89 of them. The weekend of the 10th October was also the weekend of the Country File Ramble for Children in Need so Pudsey helped us climb the hill and raise some money for the charity. On October 29th 2015, Ramblers Scotland gave evidence at the Scottish Parliament which proposes to extend the Pentland Hills Regional Park Boundary to include the entire range of hills. The Bill intends to extend the boundary south-west into South Lanarkshire and the Scottish Borders. Ramblers Scotland is in principle in favour of this.